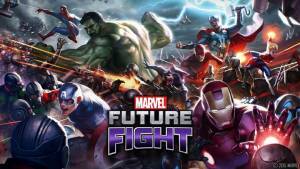 This action RPG based on the Characters of the Marvel Universe tells the story of how Jocasta, the robot bride of Ultron recieves a message from Nick Fury in the future concerning a threat that needs to stopped in the present. You begin the game with a team of three made up of Captain America, Iron Man, and Black Widow and you dungeon crawl through various situations adding new heroes and villains to the roster. The missions you are given are straight forward and mainly consist of clearing out the bad guys. There are two types of controls on offer, you can either use the touch-based control scheme or the virtual stick with buttons. There is also an auto-play feature if you want to see how the A.I. effecintly uses your characters skills in battle. Mini-stories that change every day. Side missions with stories based on the Guardians of the Galaxy & Marvel’s Ant-Man synopsis’. Players form a 3-man team to battle a boss. Players form a 3-man team and 5-man support team to battle one of multiple special bosses. 1This game really Scrapes Ice!